Trae Blanco currently serves as Director of University Bands at Murray State University in Murray, KY. His teaching responsibilities include conducting the University Orchestra, the Wind Ensemble, teaching conducting, and overseeing the band program. 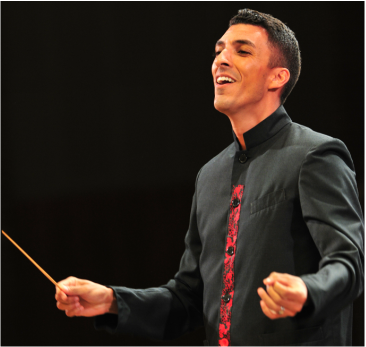 Previously, Dr. Blanco served as the Director of Bands at the University of Southern Maine, conductor of the Portland Youth Wind Ensemble, Casco Bay Wind Symphony, and cover conductor for the Portland (ME) Symphony. A native New Mexican, Dr. Blanco received his undergraduate degree in music education from New Mexico State University in Las Cruces, NM, and a Master of Music in conducting from the Indiana University Jacobs School of Music where he studied with Professor Stephen Pratt. Dr. Blanco also served as Director of Bands at Las Cruces High School, where both the jazz ensemble and wind ensemble were selected as Honor Bands for the New Mexico All-State Convention in 2010 and 2011, respectively. As a clinician, Dr. Blanco has worked with bands and orchestras in Maine, New Mexico, Arizona, Texas, Kentucky, and presented at conferences for the Maine Music Educators Association and the West Virginia Music Educators Association. Dr. Blanco serves as the conductor of the Philharmonia Orchestra for the annual Quad State String Day at Murray State, and will conduct the Paducah Symphony Summer Music Camp Orchestra in 2019. In summer of 2019, Dr. Blanco will serve as an invited presenter to the World Association of Symphonic Bands and Ensembles in Bunol, Spain as well as a conductor for the Blue Lake Fine Arts.Dr. Blanco has been a staff member for the George N. Parks Drum Major academy for over ten years, and also serves as a leadership clinician to marching bands throughout the country including Texas State University, Murray State, University of the Incarnate Word, and Pearland High School. A strong proponent for new music, Dr. Blanco has commissioned new music for winds from Jim (James) Bonney, Steven Bryant, Aaron Perrine, Onsby Rose, Steve Danyew, James Syler, Jim Stephenson, Brett Kroening, David Dzubay, and others. Dr. Blanco’s research on BCM International has appeared in the National Band Association Journal and the WASBE Journal. Dr. Blanco was the recipient of the New Mexico Music Educators New and Emerging Teacher Award for 2010. He is currently a member of the Kentucky Music Educators Association, College Band Directors Association, WASBE, NBA, and the Percussive Arts Society. He has continued conducting studies with workshops across the country and in July 2015, Dr. Blanco was a guest conductor with the United States Army "Pershing's Own" Concert Band in Washington, D.C. In both 2015 and 2016 Dr. Blanco was a finalist in the American Prize in Wind Conducting. Currently, Dr. Blanco resides in Murray, KY with his wife, Kelsey Blanco, lyric soprano, and their daughter Ophelia.